Meet the owner, Marcus Lamb! Owner Marcus Lamb tells us about how he developed his passion for food from his time working in London, France and America. It was really just because cooking is the only thing I’ve always felt I could do. I took a gap year from university and worked as a waiter in France, I really wanted to be in the kitchen but I wasn’t allowed because I couldn’t speak French. After a while I left and moved down to St Malo in Brittany, I managed to get a job in a restaurant kitchen cooking fresh seafood and traditional French cuisine. It was great! After my gap year, I returned to university but I hated it. I stuck it out and finished my course, but as soon as it was finished I moved to London to study a culinary diploma. I worked in London for a while before working in America for a year. I came back to the UK and in 2005 I decided I was going to start my own business. I had a passion for cooking and I wanted the freedom to do my own thing. 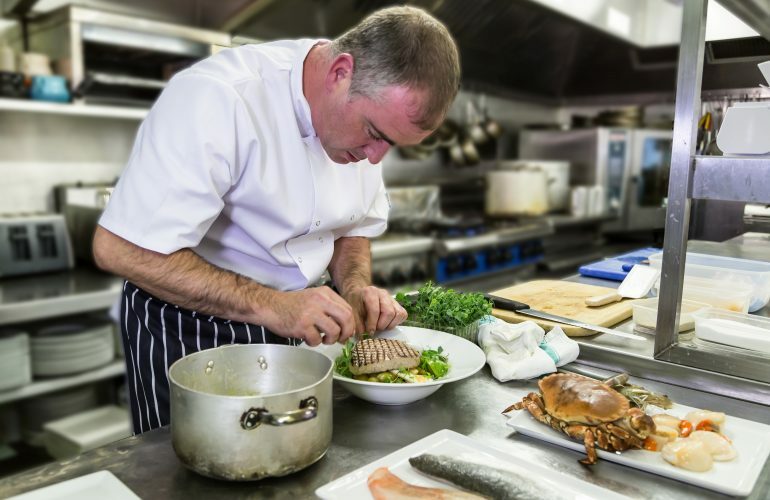 What is the best bit about being a chef? I love using high quality, locally sourced foods. When I find a good local farm or supplier right on my doorstep, that has to be the best thing for me. I love to create tasty dishes and being able to support my local economy in the process is even better. What is the worst bit about being a chef? Unquestionably, working hours. I work a lot of split shifts which means I miss out on a lot of family time. Cold, simple seafood. The British coastline offers some of the best seafood in the world and by far my favourite is fresh crab with some homemade bread and mayonnaise. My favourite food to cook has to be fish. It’s so easy to make a really simple but tasty dish. The first meal I ever remember cooking was a mild beef curry for my mum and dad. It was brilliant. I also remember I tried it again not long after and it went wrong. Good old, home cooked steak and chips. What did you do before you bought the pub? Before I bought The Crown Inn I was lucky enough to have had the chance to travel to France, London and America. I experienced working with different cuisines in different restaurants, before deciding to start my own restaurant. I wanted to share my love of food with other people and I felt opening my own place was the best way to do that. That has to be a pizza I had in Sardinia. It was something so simple but incredibly tasty. Everything was freshly made and locally sourced, it was just oozing with flavour. If you could eat anywhere in the world, where would it be? Anywhere by the sea in Italy, large glass of white wine in hand. Perfect!